Our Canine Coach training is a custom curriculum designed by a registered canine behaviorist. It has been independently approved by both the International Association of Animal Behavior Consultants (IAABC) and the Certification Council for Professional Dog Trainers (CCPDT). Our Support Office employs an environmental biologist, veterinary scientist and canine behaviorist – together, this dream team helps ensure the highest level of safety in all Dogtopia locations. The Meet & Greet includes vaccination confirmation, review of history and health, nose to tail assessment and an evaluation of your pup in our open-play environment with other dogs of different sizes and temperaments. 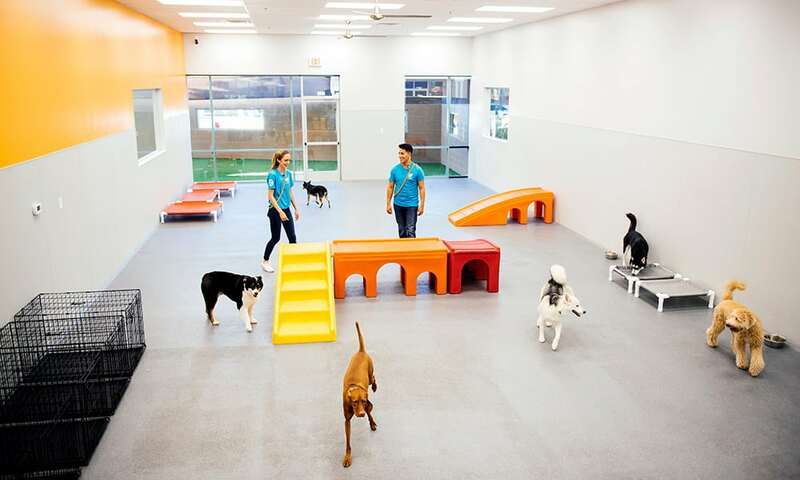 Dogtopia dogs are separated into playrooms based on both size and temperament. It’s not uncommon for a pup to start in one playroom and move to another as he or she grows, matures or as play preferences change. For times when your dog needs a little “me” time, private feeding and/or administering of medicines, naps and overnights, we use home-style crates so they have a safe place to rest. Puppies may get a little more “me” time in their early months as they often need more frequent rest. We have developed a cleaning program that utilizes a pet-safe spot cleaner that is used when dogs are playing in our open playrooms. Additionally, our playrooms are sanitized twice daily from top to bottom. This special, compressed flooring aids in the long-term joint and paw health of your furry child. We keep your pup the perfect temperature during play time, and nap time and help keep the air fresh and clean. So you’re never separated from your pup, we have webcams in every playroom – you can watch your furry child play throughout the day (excluding naptime and overnight)! Our network of dog-loving store owners across North America encourages the healthy exchange of new ideas.